:Join Harriet, Darwin's pet tortoise, and Milton, Schrodinger's indecisive cat on a time-travelling quest of discovery, unravelling scientific exploration and religious beliefs and how they fit together. Throughout the centuries humans have been looking for answers to BIG questions - how did the universe start? Is there a God behind it? Has science explained away the need for a God, or can faith enhance scientific discovery? On this adventure Harriet and Milton are investigating who the first scientists were. Step into Harriet and Milton's time machine, bring some snacks, and enjoy this curious quest of discovery - become a Mesopotamian stargazer, cast your vote in 'Greece has Scientific Talent', and meet Pythagoras! Written by Julia Golding, winner of the Waterstones Children's Book Prize 2006, and the Nestle Smarties Book Prize 2006. 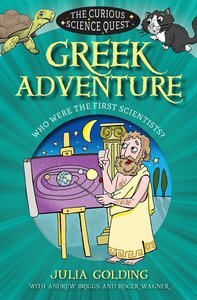 About "Greek Adventure: Who Were the First Scientists? (Curious Science Quest Series)"
Julia Golding is the author of more than a dozen children s books, and she s married with three children and lives in Oxford, England. Her continuing adventures of Cat Royal include "The Diamond of Drury Lane", "Cat Among the Pigeons", and "Den of Thieves". Andrew Briggs is a Norfolk-based maths teacher and looking for patterns to solve puzzles is part of his job. He has always enjoyed doing puzzles, crosswords, logic problems and more and has been interested in Sudoku almost since it came to Britain. Over the years he has produced various puzzles for church magazines, encouraging both old and young to enjoy their Bibles and expand their Bible knowledge. Wagner received his Bachelor of Arts from Westmont College in 1970 and his Master of Divinity from Westminster Theological Seminary in 1973. He is currently a Doctor of Ministry candidate at Westminster Theological Seminary in California.